This so-called time-resolved satellite gravimetry makes it possible, among other things, to monitor the terrestrial water cycle, the mass balance of ice sheets and glaciers, and sea level change, and thus to better understand the mechanisms of the global climate system, precisely assess important climatic trends, and to predict possible consequences. A review in the journal Nature Climate Change now presents highlights in the field of climate research based on GRACE observations. 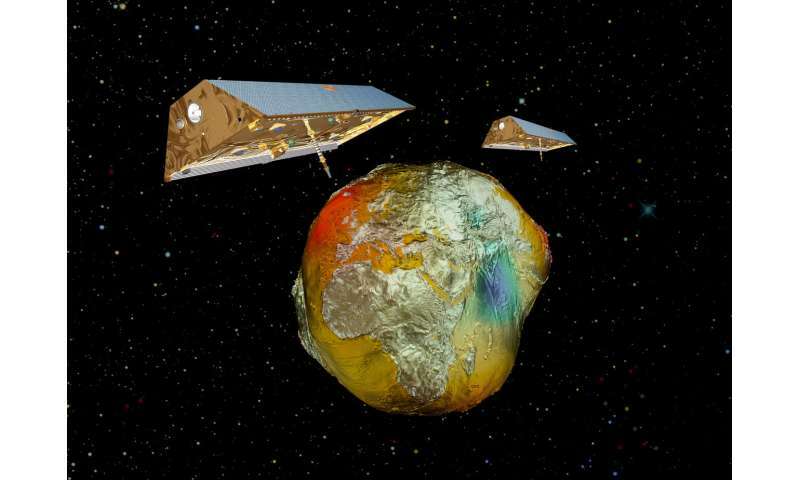 GRACE produced the first-ever direct measurement of ice-mass loss from ice sheets and glaciers. Previously, it had only been possible to estimate the masses and their changes using indirect methods. Within the first two years of the mission, it was already possible to observe clear signals of ice-mass loss in Greenland and Antarctica. The measured data showed that 60 percent of the total mass loss is due to enhanced melt production in response to Arctic warming trends, while 40 percent is due to an increase of ice flow into the ocean. According to GRACE data, between April 2002 and June 2017, Greenland lost about 260 billion tons of ice per year, Antarctica about 140 billion tons. In addition to long-term trends, the gravity field data also provide evidence of the direct effects of global climate phenomena such as El Niño on ice sheets and glaciers worldwide. Among the most impactful contributions of the GRACE mission has been the unveiling of Earth's changing freshwater landscape, which has profound implications for water, food and human security. Global estimates of GRACE trends suggest increasing water storage in high and low latitudes, with decreased storage in mid-latitudes. Though the GRACE record is relatively short, this observation of large-scale changes in the global hydrological cycle has been an important early confirmation of the changes predicted by climate models through the 21st century. Analyzing GRACE data also helped researchers to assess the sea level more accurately, as the storage of freshwater on land is linked to the sea level by various mechanisms. Analyses of GRACE data have enabled the first-ever estimates of groundwater storage changes from space. They confirm excessive rates of groundwater depletion from individual aquifers around the world. The data on terrestrial water storage have also contributed to the validation and calibration of various climate models. Within this century, sea level rise could accelerate to 10 millimetres per year, a rate unprecedented during the past 5000 years, and a profound and direct consequence of a warming climate. High-precision sea level measurements have been available since the early 1990s, but they only show the absolute sea level change. In the 25 years between 1993 and 2017, the sea level rose by an average of 3.1 millimetres per year. To find out how thermal expansion, melting ice and the continental influx of water each affect sea level, it is necessary to study the water's mass distribution. GRACE has shown that 2.5 millimetres of the average annual sea level rise of 3.8 millimetres between 2005 and 2017 is caused by the inflow of water or other mass and 1.1 millimetres by the thermal expansion of water. Resolving this composition is important for sea level projections. GRACE data provide a constraint on ocean mass change, and thus indirectly on the Earth's energy imbalance, which is a fundamental global metric of climate change. GRACE has shown that most of the warming released by the rise in temperature occurs in the upper 2000 metres of the oceans, which are the most important energy sinks of climate change. GRACE also contributes to a better understanding of the dynamics and impact of ocean currents, in particular for the Arctic Ocean. The gravity field data of the GRACE satellites has improved the United States Drought Monitor. This helps U.S. authorities to react to droughts in a timely and sensible manner. With the European Gravity Service for Improved Emergency Management (EGSIEM), the European Union has promoted a service designed to identify regional flood risks as early as possible. Between April and June 2017, test runs with historical flood data took place, showing that the wetness indicators for large river basins determined by GRACE can improve forecasts of the Mississippi or the Danube, for example. Current results also show that GRACE data can be used to predict the risk of seasonal wildfires more accurately. The GFZ operated the GRACE mission together with the German Aerospace Center (DLR), and on the U.S. side with the NASA Jet Propulsion Laboratory (JPL). In May 2018, the stakeholders launched the follow-up mission, GRACE Follow-on (GRACE-FO). The first monthly gravity field maps should be available to international users by the end of July this year. Unexpected difficulties delayed the submission of the products. "The reason was the failure of a control unit on the second GRACE-FO satellite," explains Frank Flechtner of GFZ. "This made it necessary to switch to the replacement unit installed for such scenarios. But now, with GRACE-FO, a more than two-decades-long recording of the mass changes in the system Earth is within reach." A tiny part of the gravitation emanating from the Earth is based on water on or near the surface in oceans, rivers, lakes, glaciers and underground. This water reacts to seasons, storms, droughts or other weather effects. 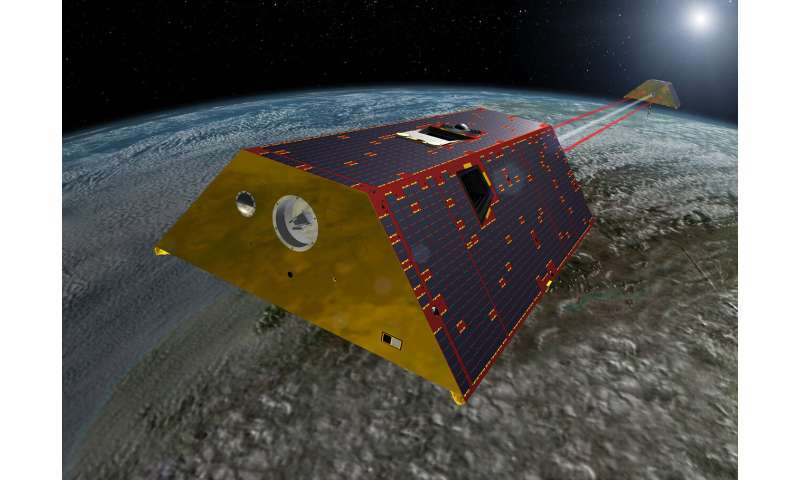 GRACE took advantage of the mass displacement of water by recording its effect on the satellite duo that orbited Earth 220 kilometres in a row. Microwaves were used to measure their distance. This distance changed over time due to the mass shift on Earth. From the data, the researchers then calculated monthly maps of the regional changes in the Earth's gravitational pull and the causal changes in the masses on the surface. An undeniable assessment of the gravity of the situation. Interesting context to the other climate science article, where science denialists trolled about trend "hiatus" fluctuations, not so much in the integrated sea level increase record. Also, the twice rate of northern polar melting. Obviously ice cover, different geology, local climate trends et cetera, but a great deal could be that southern sea circulation surrounds the pole, northern sea reach into it: isolation circulation vs mixing circulation. I'm glad you were able to weigh in on the subject. Miami isn't underwater you goofball genius.